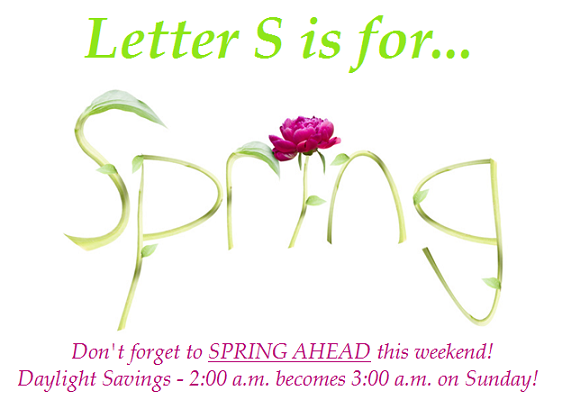 “Letter S is for Spring Week” is Next! 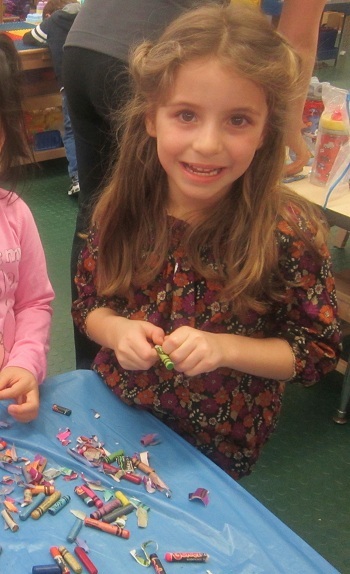 “Letter R is for Recycling” Week was Radiant, Robust, Resounding, and Really, Really Radical! Read on below to learn about the fun that was had and learning that took place! The students returned from the weekend and immediately began filling the share box with what seemed like every letter R share under the sun! Race cars, Rocket ships, Rabbits, Robots, Rescue Vehicles, Rats, Radishes and of course, a lot of Recyclable materials were brought in and shared during morning meeting. After morning meeting had wrapped up on Monday and Tuesday, the students worked on their letter R tracing/writing activities throughout their morning stations. 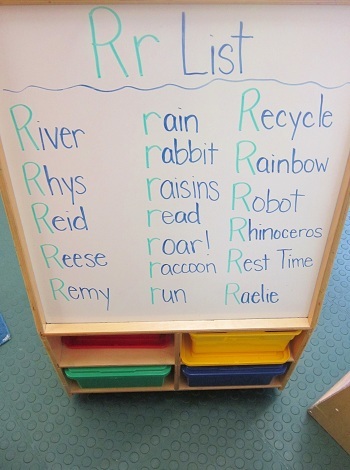 Later in the afternoon, the students created their Letter R word list and also hunted around the room for the Letter R. Here is the list they came up on Monday. Things were a little Ridiculous on Wednesday. The students were all baffled as to why they had not been called over to complete their morning work right after morning meeting. One by one, the students came over to the teachers to remind them that they had not been called yet. The teachers assured them that they would do their morning work soon. By the time snack time rolled around, the students were completely confused as to what would be happening today. Did the teachers forget about morning work?!?! As the students gathered on the rugs for a story read aloud before snack time, the teachers prepared them for what they would be doing for “mid-day work”. After a brief discussion about Recycling, the students were in agreement that Recycling means to take something, make it a little different and then use it again in a different way. Also discussed was the idea of Reusing something. The students determined that Reusing something does not change the thing itself, just the way it is used! One particularly Earth-conscious student reminded the group that sometimes you can reuse something in the same way you used it the first time too. He proved this idea by saying that he reuses his drink cup again and again, always in the same way! The student’s addition to the discussion was a perfect segue to the activity that the teachers had planned for that day! While sitting at snack time, the students would be asked to identify exactly what from their snack/lunch could be recycled or reused! While at the snack/lunch tables, the students excitedly began identifying all of their recyclable items in their lunch bags! Whether it was a yogurt cup or an applesauce pouch, the students recognized that it was plastic and could definitely be recycled. Other students held up their juice boxes and napkins* to show that they could also be recycled because they are made from paper! *The rule the students established about napkins is as follows: If it is a mess, perhaps tossing would be best! The students enjoyed their lunches then gathered all of their recyclable items from snack and lunch together. With the help of a teacher, the items were stapled or taped onto a recycling bin coloring sheet. Here is how the completed project turned out. 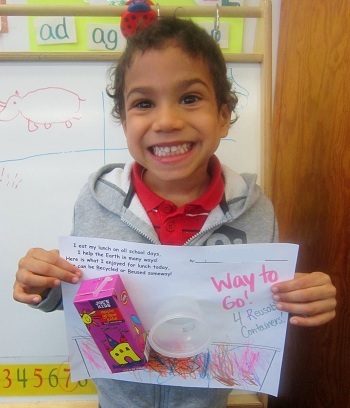 Take a look at this student who is really Earth-friendly! 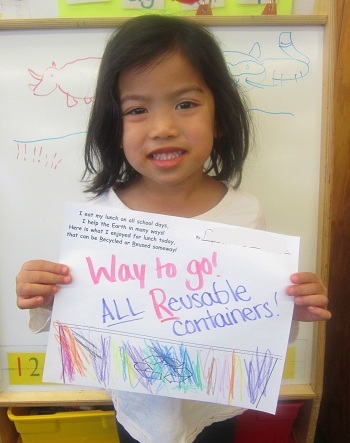 Her lunch was full of entirely reusable containers! Way to go! 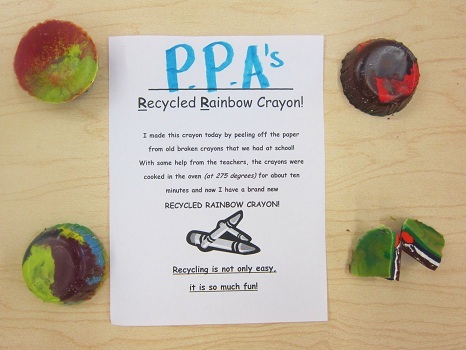 On Thursday, the students learned about recycling an essential classroom material – crayons! Rather than throwing away all of the crayons that were broken, the teachers have been collecting them in a baggie. Since it has been a long school year already, this baggie began to get a bit too full. The students were so excited (and a bit confused) about how the broken crayons could be recycled and used again when they were all so small. First, the students were asked to select the colors they wanted and peel the paper wrapping off of those crayons. Next, the students added the crayons to the tin-foil lined baking tin. With the help of the teachers, the tins were placed into an oven (preheated to 275 degrees) and baked for about ten to fifteen minutes until they had melted entirely. Into the freezer the crayons went to cool and before you can say, “Ricky the Robot Recycles Raggedy Rubber Race car tires” the crayons were ready! The crayons turned out really radical and of course, rainbow! We hope that all of our students enjoyed making beautiful rainbow pictures with their newly recycled Earth-friendly crayons! 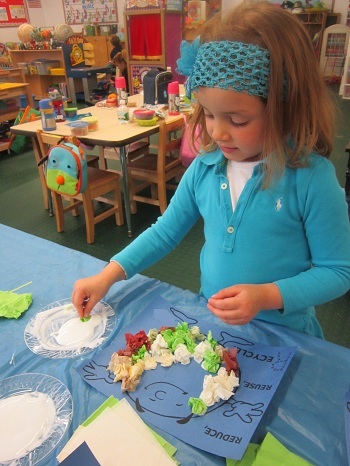 On Friday, the students continued crafting projects about keeping the Earth clean! 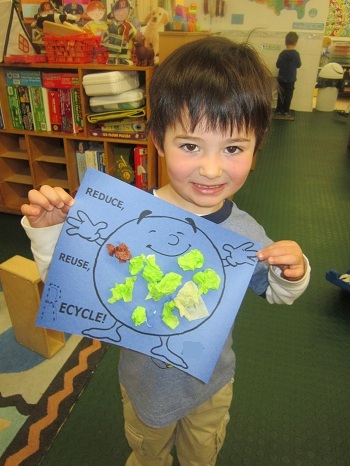 Three major ways to help the Earth just happen to all be letter R words – Reduce, Reuse, and Recycle! After discussing ways that the students could reduce, reuse, and recycle, they created the following art project to help them remember! During the afternoon on both Thursday and Friday, the students participated in Spanish class where they continued learning their La Ropa (Clothing) vocabulary. Here are the following vocabulary words that the students discussed. Friday afternoon wrapped up with a Radical Recycling technology presentation all about – you guessed it – RECYCLING! Watch the two part video clips below to learn how the things we throw into our recycling bins actually get recycled! After seeing how the recycling process actually happens, the students enjoyed singing along to the recycling song! Well, that is all for “Letter R is for Recycling” Week. As always, we thank you for reading. Have a fun and safe weekend! Parent Teacher Conferences will be taking place Monday, March 19th – Friday, March 30th. Be sure to check the calendar board or your email for your schedule conference time.